In this amazing space wallpaper from the Wide Field Imager on the MPG/ESO 2.2-metre telescope at ESO’s La Silla Observatory in Chile young stars huddle together against a backdrop of clouds of glowing gas and lanes of dust. In this amazing space wallpaper from the Wide Field Imager on the MPG/ESO 2.2-metre telescope at ESO’s La Silla Observatory in Chile young stars huddle together against a backdrop of clouds of glowing gas and lanes of dust. 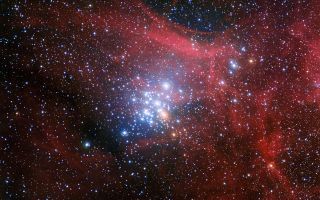 The star cluster, known as NGC 3293, would have been just a cloud of gas and dust itself about ten million years ago, but as stars began to form it became the bright group we see here. Clusters like this are celestial laboratories that allow astronomers to learn more about how stars evolve.